I'll start by saying we didn't encounter any aircraft, lights, booms, or any of that other great stuff we all enjoy witnessing. It all started as a stop for a road trip my friends and I were taking for the summer. 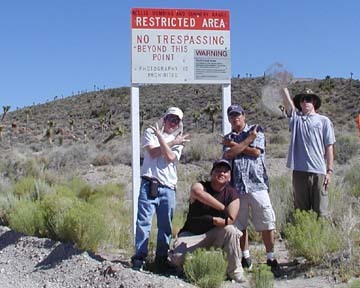 Straight out of the accurately dubbed Lost Wages (Las Vegas), we drove up to the city of Alamo and later to the GLR to set up camp. While cruising down GLR, we noticed a dust trail that looked like it was coming from a vehicle. We never really confirmed it, but it probably was a cammo dude, since it didnt seem to be kicked up by wind. After being asked where the border was about 20 times by my friends, we slowed and approached a nice flat area to set up camp. Before we even got close to stopping we picked out a cammo sitting on a hill. Since it was getting dark fast, we started lying everything down immediately. I commented " They have to sit there and watch losers like us", to which my red-headed friend Chad replied: "Ha, poor bastards". That night after we got everything rigged up, we took a quick stroll down to the border. As we approached the border the cammos hit a bright white light on us. We proceeded to frollick and point our flashlights wildly. 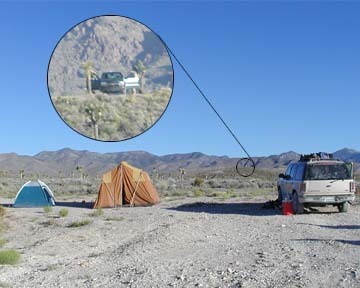 After that ordeal we went back to camp thinking of ways they might retaliate. We were hoping they would sand blast us, although it probably never happen. I slept fine that night, but my friends didnt. They had a tent that flapped in the wind, making a sound much like somebody touching their tent, it was beautiful. Alas, we didnt get blasted or pranked that night. Like a kid on Christmas day, I got out of my tent and quickly set up a 45x sighting scope. While watching one of the cammos get out a pair of binoculars and look at us, I yelled to the guys to all wave at him. The dude put down his binocs for a second, then looked through them again. We waved again. Much to my suprise they laughed, they must have not seen me with my scope. So we took down camp and planned our next hit on the cammos. After we had everything loaded we drove up to the border rolled down our windows, played loud bluegrass (Lester Flats - Foggy Mountain Breakdown) and had a ho down right on the border. Then we got out our 4 pieces of poster board and we each wrote 2 messages. They included "Free Alf", "Nerd life", "We got your picture", and "Sand Blast Us!". There were others, but they may not be appropriate to list here. So we went one at a time showing them our signs. They didnt show any emotions during the whole process. 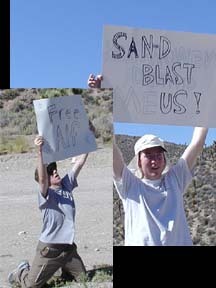 In fact, they drove off the hill and back to the guard station after we were done showing off our signs. So we took some pictures of the border, pictures of us taking pictures of the photograpy prohibited signs, etc. We lost our audience, so we left too. After taking a few shots at the black mailbox, we started to drive up to the North Gate. Heres where it got fun. Right when we stepped out the car we noticed that our driver's side, rear tire was going flat. We got right back in the car and drove out as fast as we could. We got about 1.3 miles away from the north gate. So we hopped out and started to get the jack out. So sombody *cough* me *cough* put the jack in the wrong position ( I put it behind the wheel on the frame) and someone else started to crank. They broke the arm used to crank the jack and the hook needed to lower the spare along with it. So my red-headed friend ran towards the north gate to see if the cammo's were as friendly as they are said to be. About 30 minutes later he comes jogging back with a "Nobody was there". So we decided to cruise at low speeds (about 6 mph to be exact) on the flat for as long as possible, since we were around 7 miles from the Ale'inn. That didnt work to well, by the time we shredded the tire, we were still around 5+ miles from the Ale'inn. Walking in the the Ale'inn, Pat could tell we had been in the sun for a while and offered us some ice water. After we mentioned what we had just done, the patrons of the bar quickly looked over at us in amazement and Pat offered to let us use her phone to call for a tow. After calling, having an Alien burger, and wondering if the guy at the bar that looked like Joerg was really Joerg, our two friends arrived at the inn in a Lincoln County sheriff's car. It so happens the cammos called in on them, and the two cammos were the two we hassled that morning with the signs. While we were discussing the tow, Joerg and BlackF150 offered to give us a ride out to the car with a jack. We canceled the tow right away and took the ride. One thing I'll always remember Joerg's reaction to when we told him we hiked out from the north gate. He said "Holy s***!" two or three times. So we got out to the car, switched the tire and were on our way to freedom. We continued to drive on to Page without a spare (riskfully and very carefully), due to the fact that the shop in Alamo didnt have the tool to lower the shreded spare. Another thing was that it was the 4th of July weekend so we couldnt get a spare easily. That was our first trip out there, and I can say it probably wont be our last. We would like to thank Joerg, Pat, BlackF150, and the town of Rachel in general for their help and support.